Pokies from Australian developer Aristocrat tend to come with some rewarding bonus features, but one of the most lucrative extras has to be the Cash Explosion that’s seen across 4 different games and can lead to progressive jackpot payouts. 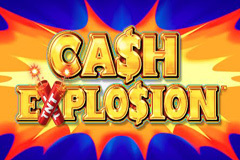 Available at land based casinos only, the Cash Explosion features can occur across the Emperor’s Treasure, Indian Moon, Fiesta Sun and Eyes of Fortune games, which all have very different themes, but identical gameplay, with 5 reels of symbols set over 3 rows and the Reel Power Plus format. What this layout means is that it doesn’t matter what position on a reel that symbols land on, as long as 3 or more of the same type appear on adjacent ones running from the left side and with 243 possible ways to line them up, there’s plenty of opportunities to get a prize, although they can be on the small side. Available to play from just 0.30, players can of course stake more per spin, which will make each win that more valuable, but the extra features on these games can more than make up for the modest wins in the normal run of play. With the cabinets topped off in big gold lettering, where the ‘S’ of Cash Explosion is replaced by a ‘$’ and the ‘X’ is represented by crossed sticks of dynamite, there’s no missing these pokies on the casino floor. What Happens with Cash Explosion? The base games all feature the playing card symbols 9, 10, J, Q, K and A forming the smaller wins, while unique picture symbols will pay out the higher prizes. Common features include wild symbols that multiply the value of any lines that they complete when substituting for other symbols, with the actual value of the multiplier being assigned at random. While it’s possible to land one as high as 30x, players will find that 2x to 10x is more common, but however much it is, this is still a nice extra reward to receive. Scatter symbols trigger free spins games, with players able to decide whether they want lots of spins with small wild multipliers, or fewer spins where any wins created by wild symbols will be multiplied many times over. The number of spins goes from just 10 to as many as 25, while the potential multipliers range from just 3x to a huge 30x. It’s up to each player to decide what they want, although the average returns are around the same with all options, so it really just depends on whether they like to see lots of spins play out, or just want a few and hope for a wild substitution to occur sooner rather than later. Each game carries several shared progressive jackpots that can be won in a couple of different ways. The randomly-awarded Pick’em Bonus opens up a screen that features 20 of the plungers used to set off explosives and players need to click them in turn, hoping to reveal 3 of the same jackpot type, either Mini, Minor, Major or Grand, while they could uncover free spins, or strike out and find 3 plungers that end the round without a win. Occasionally, players will see the TNT symbol landing on reel 5 on the right side and if they manage to land a row of 5 matching symbols right across the reels at the same time, the TNT goes ‘Kaboom!’ and they will win any of the jackpots. As their names suggest, the jackpots range in size, with the Mini and Minor being just a few Dollars, while the Major has a starting level of $500 and the Grand starts at $10,000, with each wager made across the games increasing the prize pots, so players could potentially scoop a fortune. The games are all presented in the style which Aristocrat have become well-known for, with picture symbols that define the different themes of each, and with background images customised to match. Emperor’s Treasure is set in ancient China, while Fiesta Fun is themed around traditional Mexican celebrations. A tiger stares from the reels of Eyes of Fortune, with other creatures joining him on the reels, and lastly, we have Indian Moon, with wolves, chieftains, tomahawks and tepees filling the game, all alongside the playing card symbols of course. The idea of sharing progressive jackpots among several different games isn’t new, but Aristocrat have done it in style, with 4 well-designed pokies that look good and have decent bonus features. As the free spins, wild multipliers and scatter payouts are the same, players can just select which theme appeals to them and activate that version, and they could strike it rich with the main jackpot features that can occur at any time.